Tsun held great respect for magic, which he called the "Clever Craft", and wielded the power of the Voice. He and others desired to face Alduin when the Time-Eater set his soul-snare in Sovngarde, but for reasons unknown, Shor held them back, though Alduin's grip on Sovngarde eventually was broken by the Last Dragonborn. While Tsun's brother Stuhn entered the Imperial pantheon of the Eight Divines as Stendarr, it's never been explicitly stated that Tsun bears any relation with any other cultural aspect of a deity. 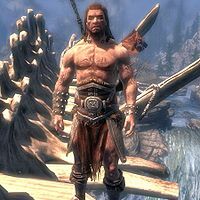 However, how he is presented in Varieties of Faith in the Empire hints at a connection with Zenithar of the Bretons, Z'en of the Bosmer, and Zeht of the Redguards. ^ a b c Tsun's dialogue in Skyrim.